The consequences of a centuries-old bargain fall on Prosper Redding. The Reddings, premier WASP family of the posh Massachusetts town of Redhood, are rich, talented, and successful—except for 12-year-old Prosper, a bullied D student. On Founder’s Day, the extended family gathers, taking twins Prosper and Prue to the dungeon basement of their family estate for an odd ceremony that ends in an attack on Prosper. Rescued by a stranger, he wakes to learn that his rescuer is his disgraced uncle, Barnabas Redding. Aided by his witch daughter, biracial, bronze-skinned Nell (whose identity goes largely unplumbed), Barnabas has hidden Prosper from the Reddings. Barnabas and Nell tell Prosper of a complicated mythology (it involves four realms: of humans, spirits, fiends, and ancients) and explain that in 1693, Honor Redding made a deal with a type of fiend called a malefactor in exchange for family prosperity. A later attempt to break the contract went wrong, enabling the malefactor—Alastor—to be reborn, trapped in Prosper. Alastor waits, gathering his strength to escape for vengeance on the Reddings—which Prosper must prevent. 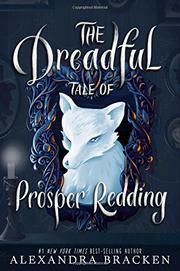 Alastor’s supernatural threats aside, Prosper thrives in hiding, out from the Redding shadow. From time to time, sometimes conveyed in third-person breaks in Prosper’s narration, the entertaining Alastor possesses Prosper, leading to comedic moments as he adjusts to the modern world. The betrayal- and twist-packed conclusion sets up the sequel.